On Feb 14th, 1990, Indian Airlines Flight 605, an Airbus A320-231 (Registration VT-EPN), was operating a scheduled passenger flight from Bombay to Bangalore, India. The Captain in the left seat was flying the aircraft and was undergoing the first of 10 route checks required for qualification to Captain. A check airman was flying in the right seat. 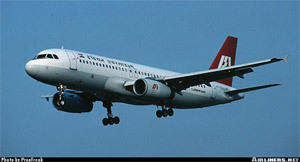 There were 7 crew members and 139 passengers on board the aircraft. The flight from Bombay to the Bangalore was uneventful. The Weather at Bangalore was good, with landings being conducted on runway 09. The flightcrew initially planned for a VOR DME approach to runway 09, but subsequently accepted vectors for a visual straight-in approach. Initially, the airplane was properly configured for a manual approach and landing, but during the approach, the flight crew made a number of incorrect flight guidance mode selections that led to an extremely low airspeed and low thrust condition in the final stages of the approach. The flight crew did not detect the unusually low airspeed and thrust until a point from which a successful recovery would not be possible. The airplane descended below the planned glide slope and crashed into a golf course, approximately 2800 feet short of the runway, and burst into flames. Four of the seven crewmembers (including both pilots), and 88 of 139 passengers died in the crash.